Under the wrong lighting, makeup colors can fool you, and traditional makeup mirror lights don't contain the full color spectrum, so it's impossible to see subtle variations in your makeup color. With an illumination intensity of 600 lux and more, and with a color rendering index (CRI) of at least 90, the Simplehuman automatic sensor mirrors feature the special tru-lux light system that simulates natural sunlight, so you can see full color variation and always know when your makeup is color-correct and flawless. 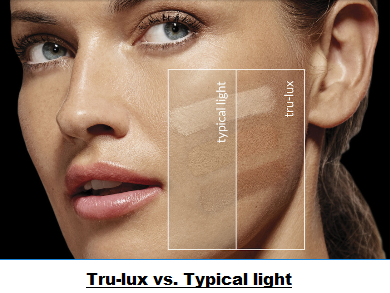 Looking good in the tru-lux light will mean that you will look flawless in any setting. These mirrors feature high-quality and ulta-clear glass, backed by high-purity aluminum coating that provides superior reflectivity and clarity. They provide exceptional detail, and their ​lighting is generated by long-lasting surgical-grade LEDs that, unlike the bulb-based lighting found in traditional mirrors, won't burn out or diminish in intensity even after years of use. Note: These mirrors should not be immersed or covered with water. Otherwise, please read on below for a detailed comparison of Simplehuman mMirrors. Most makeup mirror lights don't contain the full color spectrum, so it's impossible to see subtle variations in your makeup color. With a maximum illumination intensity of 600 to 800 lux, and with a color rendering index (CRI) of 90 and more, the tru-lux light system of Simplehuman makeup mirrors simulates natural sunlight, allowing you to see full color variations, so you'll know when your makeup is color-correct and flawless. It accurately reflects true colours and facial tones. Note that, unlike traditional makeup mirrors' bulb lighting, the long-lasting LEDs used by the Simplehuman tru-lux system won't burn out or diminish in intensity even after years of use. A lux is a measure of the intensity of illumination on a surface. The 5x magnification of these mirrors is comprehensive and allows viewing your entire face at once in exceptional detail. 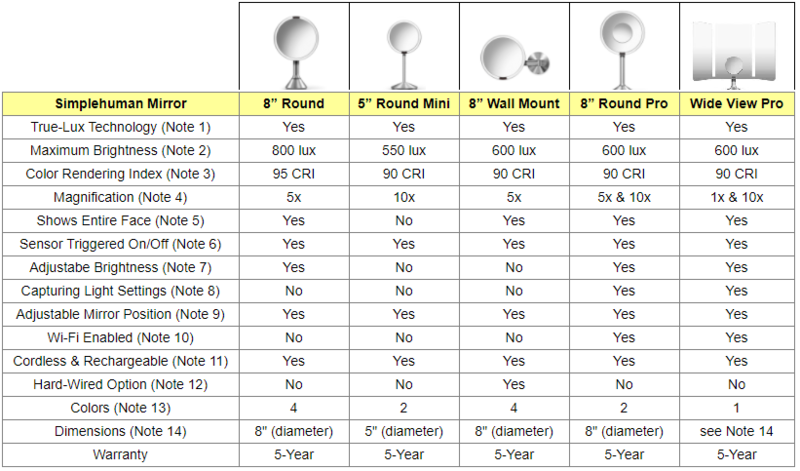 As shown in the table, both of the Pro mirrors come with dual magnifications (5x & 10x for the 8" Round Pro mirror; 1x & 10x for the Wide View Pro Mirror). Wth these two mirrors, the 10x magnification is achieved with a much smaller mirror that magnetically attaches to the main mirror, when it is needed. When it is not used, it is stored conveniently on the back of the mirrors. With the 5" Round Mini mirror, you can't see your whole face at one time. But its 10x magnification is great for extremely close-up view for detail work on small sections of your face, like tweezing and applying eye makeup. The other four mirrors considered here can all show your entire face. Each of the five mirrors considered here is able to detect that you are in front of them, so the mirror lights up automatically as your face approaches (you need to be within 12” from the mirror). When you get away from the mirror's sensing zone for more that 5 seconds, it shuts off automatically. Unlike other vanity mirrors, you never have to fumble with buttons or switches to turn on and off the mirror! The 8" Round mirror features touch-control brightness adjustment which allows intuitive control over a continuous range of brightness from 100 lux to 800 lux. With the 8" Round Pro and Wide View Pro mirrors, you will need to you use their associated App to adjust the brightness. The 5" Round Mini and 8" Wall Mount mirrors do not allow brightness adjustments. Their brightness is set at the maximum specified level. Sometimes, you may want to see what your makeup will look like in different lighting scenarios such as when dining at your favorite restaurant, when you're working at the office, exercising at your gym, etc. With the 8" Round Pro and Wide View Pro mirrors, you can use the Simplehuman mirror App on your smartphone to capture light settings from the world around you wherever you may be and accurately recreate them in the mirror. This way, you can check what you would look like in the office, your gym, your favorite restaurant, anywhere you want to look your best. The App also provides you with preset light scenarios you might want to use, in case you have not captured your own special scenarios. ​​The 8" Round and 8" Round Pro mirrors do not allow height adjustments, but their mirror head tilts and swivels to the perfect angle to allow viiewing flexibility from different positions. The 5" Round Mini provides two height options, and the mirror head swivels to the perfect angle for any viewing position. It also folds down flat for easy storage or travel. The 8" Wall Mount mirror has a sturdy stainless-steel telescopic swing arm that provides smooth, effortless adjustability. The side panels for the Wide View Pro Mirror adjust slightly forward; you can also tilt the mirror back and forth. Alexa: You can control your mirror's brightness and other smart features with your voice. For instance, you can tell Alexa to make the mirror's light brighter. Nest Cam: Whatever lighting condition your Nest Cam sees, the Simplehuman Pro mirrors can perfectly recreate. IFTTT: You can set conditions or IFTT 'Recipes' to control mirror settings and features. For instance, you can request IFTTT to dim the mirror's brightness after 6 pm. All five mirrors considered here can be recharged using a standard USB. A fully charged battery will keep the light on continuously for about 6 hours. If average daily usage is 10 minutes, one full charge should last from 4 to 5 weeks. 8" Round: Brushed Stainless Steel, Pink Stainless Steel, Rose Gold Stainless Steel and White Stainless Steel. 5" Round Mini: Brushed Stainless Steel and Rose Gold Stainless Steel. 8" Round Pro: Brushed Stainless Steel and Rose Gold Stainless Steel. Wide View Pro: Brushed Stainless Steel. As the above comparison table shows, the five Simplehuman makeup mirrors considered here come with some similar, but also a number of different features. So we suggest you carefully study the above table and clarification notes before you decide which mirror will respond best to your needs. You will find below Amazon product link images that correspond to each mirror compared above. Please click the Amazon link image below for the Simplehuman mirror of your choice to see exact price information or to purchase.